﻿﻿﻿ The ZShock Guardian Angel Ring is the newest addition to our popular Angelz Jewelry Collection. The First roll out of the ZShock Angelz Collection was our Angel Pendants that were created in both charm and pendant sizes. 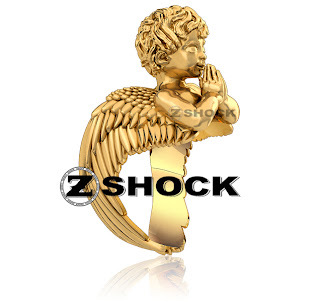 The second phase being rolled out is the ZShock Guardian Angel Ring. This ring is richly detailed from the Angels hair, face and wings and fits wonderfully. The wings envelop the finger so nicely with carved feather details that is reminiscent of an ancient Roman sculpture. The Angel is captured in a praying position that just looks serene and poised. ZShock's attention to detail and quality is yet again evident with this beautifully created piece of jewelry artwork. The Guardian Angel Ring will be available in various price points and metal options from gold tone, sterling silver, blacked out silver, to 14K or 18k solid gold.